These are kind of long hairpin,called "Kanzashi" in Japan. You can also use a hairpiece if you need.It's helpful to make you gorgeous. It seems they're finally finished dress-up. In winter,if you're cold,you can wear a shawl,too. Oh,look at these girls. They're gonna dressed-up,too. 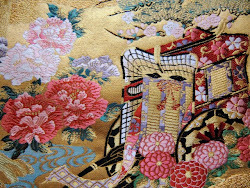 She chose red Kimono with sakura design.It's beautiful. She chose pink Kimono with a floral design.